Modeler with optional inputs or none? I realize that some SAGA algoritms acepts none input, so it can start de process allowing the selected features either. I create some regular points to use in the merge, so the next algoritm will always receive something and don´t cause an error. The question is. Is this the only and viable solution, or the long way one? because regardless the input, it takes at least 6 seconds to finish, even empty. Browse other questions tagged qgis qgis-3 qgis-modeler or ask your own question. 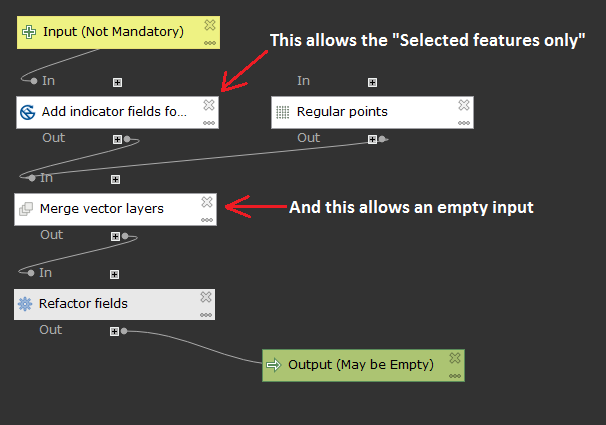 How to use the 'File' type inputs in QGIS modeler?